❂[Project Time Alarm Clock]：Bluetooth speaker alarm clock radio have five modes, one-click switching,The bluetooth speaker alarm clock make it possible to set what music you like wake-up times when you and your partner go to work at different times. You can choose standard alarm sound or the preset station you like as the alarm sound. You can read and follow the instruction manual or send your questions to our official e-mail,we will service for you to solve the problem. ❂ [Wireless Bluetooth Speakers ]：Superior sound quality,experience your music in 360 full-bodied stereo realized through dual high-performance drivers and an unique enhanced bass. Bluetooth speaker alarm clock radio compatible with all bluetooth compacity devices, speaker automatically reconnects to the last device used.Support APE/WMA/WAV/MP3 format，Bluetooth speaker alarm clock radio device also allows hands-free calls in bluetooth mode. ❂ [Large LED Display]：3.5-inch LED display without any blink makes time easy to read from a far distance softer one at night.Bluetooth speaker alarm clock radio enables you easily read the time when you lying in bed. ❂ [Listen to FM Radio]：Bluetooth speaker alarm clock radio can remember more FM preset stations, allowing you to listen to music, news and weather forecast. :Bluetooth speaker alarm clock radio can be extended for better signal reception. 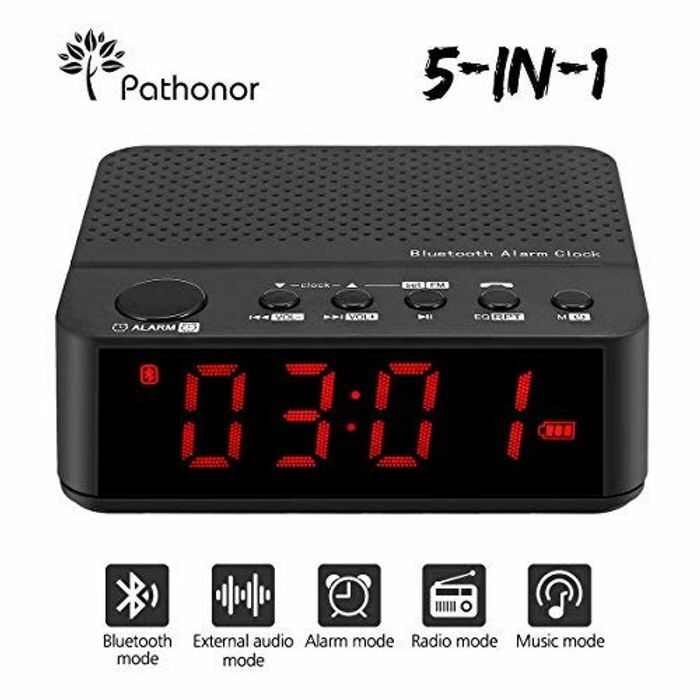 ❂ [Power supply]：Bluetooth speaker alarm clock radio built-in Li-Ion 1500 mAh rechargeable battery(INCLUDE)guarantees up to 8 hours playtime, Recharge in just 4-5 hours with included micro USB cable(NO Adapter). extra USB port to charge your cellphone ,tablet or other smart device.